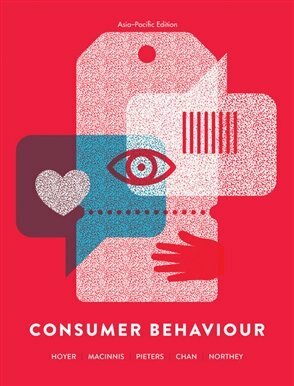 Cutting edge and relevant to the local context, this first Australia and New Zealand edition of Hoyer, Consumer Behaviour, covers the latest research from the academic field of consumer behaviour. The text explores new examples of consumer behaviour using case studies, advertisements and brands from Australia and the Asia-Pacific region. The authors recognise the critical links to areas such as marketing, public policy and ethics, as well as covering the importance of online consumer behaviour with significant content on how social media and smartphones are changing the way marketers understand consumers. * Students grasp the big picture and see how the chapters and topics relate to each other by reviewing detailed concept maps * Marketing Implications boxes examine how theoretical concepts have been used in practice, and challenge students to think about how marketing decisions impact consumers * Considerations boxes require students to think deeply about technological, research, cultural and international factors to consider in relation to the contemporary consumer * Opening vignettes and end-of-chapter cases give students real-world insights into, and opportunities to analyse consumer behaviour, with extensive Australian and international examples providing issues in context New, print versions of this book come with bonus online study tools on the CourseMate Express platform.